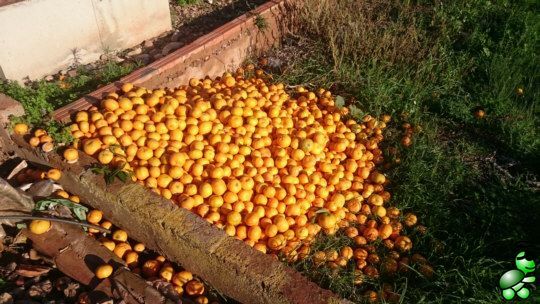 During our daily walks with our dog through the orange fields, which are now beautifully green and orange colured being amidst the harvest season, we ocasionally encounter piles of oranges (clementinas and mandarinas), such as can be seen in the photo below, which have been rejected after picking them but before they are taken to the warehouse. These oranges have been ruled out of every possibility to reach a consumer, right at the source. Why? They did not pass the pre-selection. They have insect bites, are irregular, too big, too small, too ugly - but I can garantee that they are perfectly eatable. I cannot blame the farmers for their behavior - in a market driven capitalist system this is a perfectly rational behaviour. I am a convinced believer in the virtues of the demand and supply driven mechanisms, but I find this side effect of the system to be quite disturbing.